First published in 1918, I am the proud owner of a 1918 copy of this phenomenally beautiful and insightful work by one of the true typographic masters of our industry. 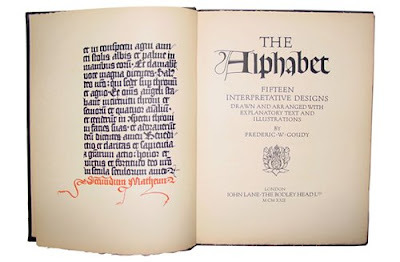 The book is split between 27 hand-drawn plates – each plate shows fifteen forms of one letter of the alphabet, including; a rendering of the lettering from the Trajan column at Rome; slanted pen capitals, black-letter capitals; Lombardic Gothic versals; Italian round-hand minuscule; black-letter minuscule; transition type from Gothic to Roman; type of Nicolas Jenson, first pure roman typeface; with the remaining being designed by the author with the exception of a Bodoni letterform and another designed by Caslon. 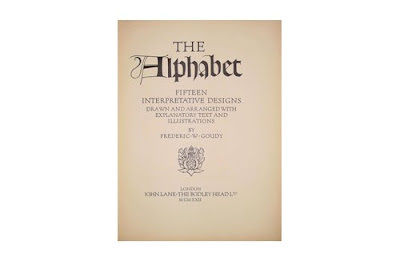 The rest of the book comprises of an introduction and seven chapters on the history of letters, and essays on type debates pertinent to that particular era. It is a truly beautiful book and one that thrills me each time I dare to take it down from the shelf. It is a brilliant typographic history. 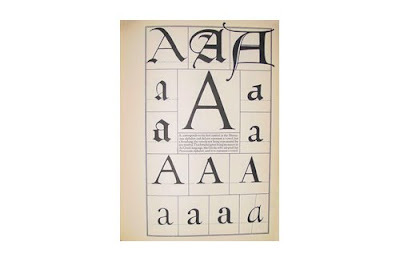 A better introduction to the history of typography I have yet to come across. While a great idea to republish by University of California Press (I am also pretty sure it was republished more recently but for the life of me I can't find who and when?) it lacks the quality of the original imprint in terms of paper stock, binding and printing. Nevertheless even in its facsimile form it is a worthy buy and will delight the reader. I paid £15 through ebay for this - its one of my few prized possessions - and consider it priceless (although you are welcome to test my resolve) – I still feel guilty 10 years on, I feel like I mugged the guy. I have on occasion used it to gauge the likelihood of a potential creative relationship by their reaction on seeing the book. This is not about coveting something old and ‘authentic’ it is as a book to learn from that I get most of my enjoyment. 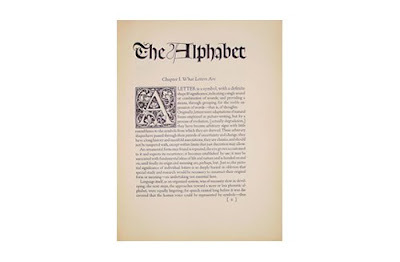 So, don’t wait to come across the next original before you purchase a copy of The Alphabet: and elements of lettering by Frederic Goudy, buy the reproduction – until an original becomes available.